A royal butler has revealed exactly where Meghan Markle's wobbly Christmas curtsy to the queen went wrong. All eyes were on the 36-year-old fiancée of Prince Harry after she joined the royal family at the Christmas Day church service at Sandringham in Norfolk. Nerves seemed to get the better of the confident actress as she curtsied for the Queen, according to Grant Harrold, who said on ITV's Good Morning Britain that Meghan's mistake was bobbing too low. The royal butler was on the show to discuss the etiquette around re-gifting unwanted Christmas presents, when he was asked to demonstrate the correct way to curtsy by presenters Charlotte Hawkins and Kate Garraway. He promptly jumped up and explained: 'What you should be doing, for a lady, is the right foot behind the left, and then it is a gentle bob. 'You keep the hands in because you're not a penguin,' he added. 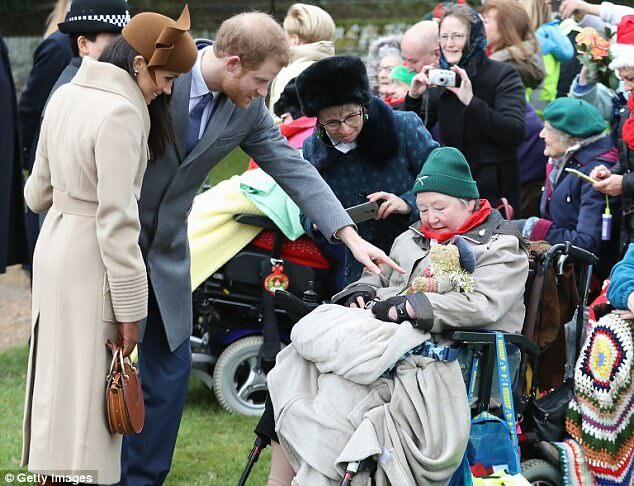 Meghan stepped out in an eye-catching brown beret and wrapped up warm against the chilly winter temperatures in a beige £986 Sentaler coat tied with a belt. Meghan clutched tight to Prince Harry's arm, proudly displaying the engagement ring that he himself designed ahead of their engagement in November. Added to her brown beret and beige coat, Meghan wore a pair of brown Stuart Weitzman over-the-knee boots and carried a $1,550 leather handbag by Chloe. She was also wearing a pair of Birks snowflakes earrings - which she previously donned at the Queen's Christmas lunch.